Developmental readiness for solid foods is one of the most important times for infants, parents, and guardians. But, when is an infant ready for solid foods? This question is very important because of the significance of the associated health challenges of introducing infants too early to solid foods. According to the American Academy of Pediatrics (AAP), introducing solid foods to infants before they are ready increase an infant’s risk of weight gain during the early years and being overweight later in life. Also, when infants are not physically ready to accept solid foods, they are at a higher risk of choking because they have not developed the necessary skills for eating solid foods. Another major challenge of serving solid foods too early is infants may consume less breastmilk or Iron-fortified formula and not get enough essential nutrients for proper growth and development. Therefore, it is important to introduced solid foods to infants around six months when they are developmentally ready to accept them. The infant has doubled his or her birth weight. As an early childhood professional, working in a Child and Adult Care Food Program ( CACFP) setting, it is important to maintain constant communication with infants’ parents or guardians about when and what solid foods should be served while the infant is in care. 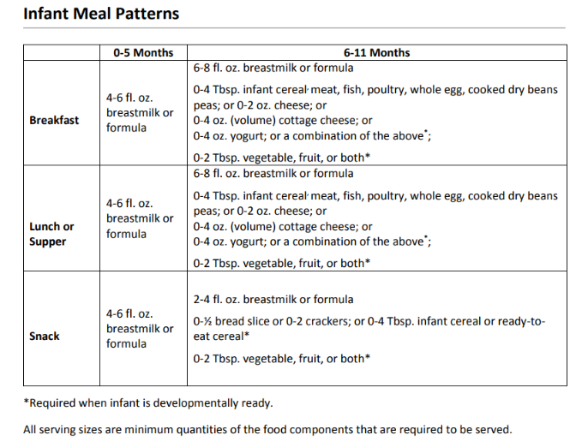 You may find it useful when talking to parents and guardians to use the AAP guidelines to help determine if an infant is developmentally ready to begin eating solid foods. Another great way to ensure you are meeting the needs of the infant is to request in writing when you should start serving solid foods to their infant.